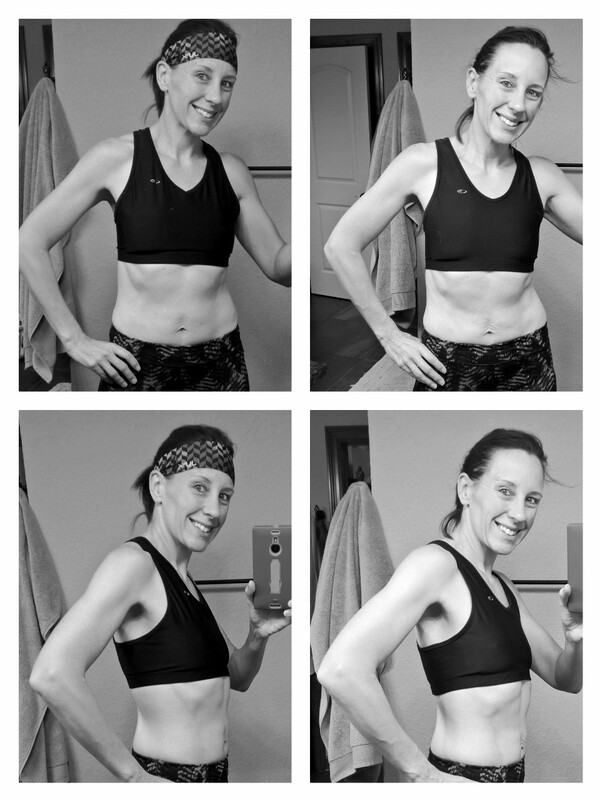 My self-imposed 8 week challenge ends this Thursday morning with a weigh-in and measurements. I was doing really well until my friend’s health took a turn for the worse 4 weeks ago. Scrambling to help them and then be there for her widowed husband and grieving family took priority, and rightfully so. No regrets there. But, it’s time to buckle down again after the ringing in of 2016. 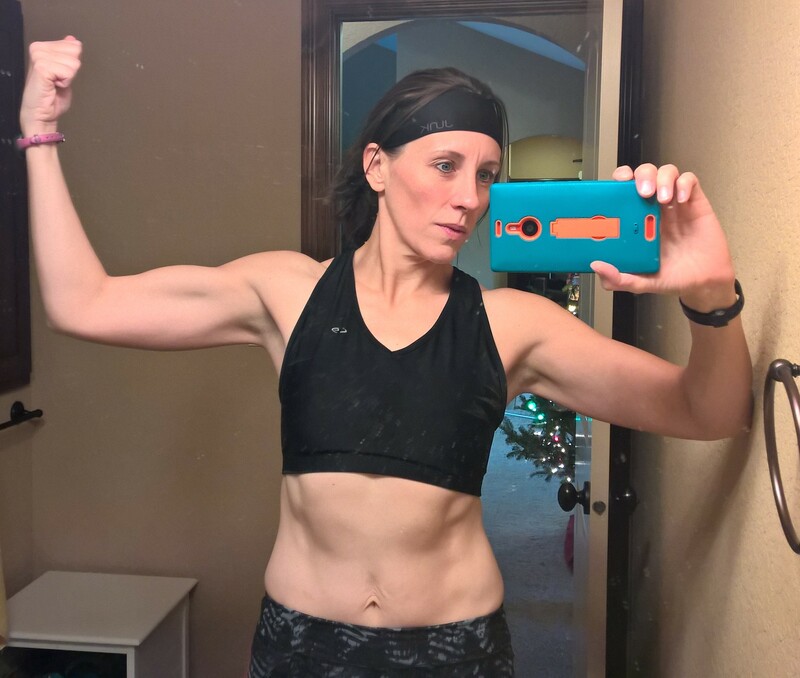 Some gals encouraged me to try the new beachbody program, Hammer & Chisel, and well…. I need a change so I said yes. Now that my box of DVDs and food measuring containers have arrived, I’m feeling nervous. Weight training is not my thing, and that’s what H&C is. 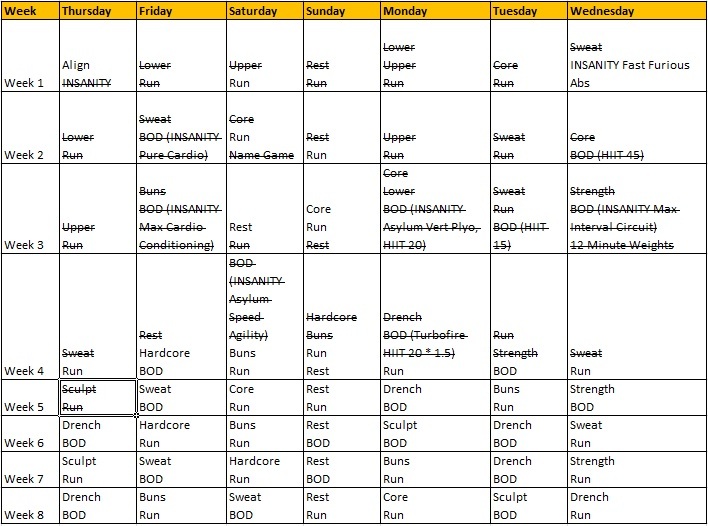 I am going to be WAY out of my comfort zone during the first 8 weeks of 2016. And that’s good. No, that’s great! But damn, those food measuring containers are small. A gal in my FB fitness group posted a picture of the back of her shoulders and it dawned on me that I’ve never even thought to look at what’s going on back there. I’ve never assessed my progress other than from the front and side. I’ve been missing a pretty important angle. I’m starting a new fitness routine on January 4th, and when I take before and after photos, they will include this angle. I was stunned today. My husband was not – he’s been seeing this develop over the last 7 weeks – but I haven’t even thought to look. Man, I wish I had before photos of this angle. This is ALL thank to Beachbody’s PiYo program! Bring on the Hammer and Chisel! I’ve indulged a bit this week – making cookies and all. It’s been tough to keep the scale under 140.8! 2 Weeks left of PiYo! It’s great – I’ll for sure still do it a few days a week! 2 Weeks before New Years and it’s time to get (more) serious! 18 Months ago, I made the decision to get myself back into shape. I’d been in shape before, had pioneered a successful running and adventure club for 2 years, and had lived the healthy life that I wanted to live. But somewhere along our road down infertility, I quit taking care of myself because I just could not take the questions anymore from the people we worked out with. “When are you going to have a baby?” “Your eggs are screaming, you need to get on it.” “Tell that husband of yours to get you pregnant.” And my favorite, “Do I need to send my husband over there to get you pregnant?” I watched women lap me in the baby-making department, and when those who already had had one child as we struggled to just get pregnant started coming to kickboxing class pregnant AGAIN, I just could not take it. So… and I hate saying this… I quit. I was on synthetic hormones for almost two years as we tried IUI’s and then quickly moved onto IVF. It took 3 rounds of IVF to finally have a successful pregnancy and by that time, I had climbed to 192 pounds. I only gained 17.8 pounds during that first pregnancy, but that put me into the 200’s and that hurt my head. I lost the weight very quickly, but remember, I only had to lose 18 pounds. By the time my first child was a year old, I was back in the 160’s due to eating a very strict paleo diet and doing some exercise (walking). We quickly moved into IVF for our second child, thinking it would take 3 rounds again, but it worked the first time (a frozen cycle with our first son’s cycle twin – conceived on the same day in the same IVF cycle 2 years earlier). I started that pregnancy at 167.6 pounds and ended up gaining 35.4 pounds that time. The weight came off almost instantly again, but I was not happy in the upper 160’s and lower 170’s. I was nursing with a pretty low milk supply, so I wasn’t going to do anything to interfere with that, including exercise, no matter how uncomfortable I was at that weight. I hovered in the 170’s for a year. In June of 2014, I decided I’d had enough. I had nursed my son for a year and if exercise diminished my supply, well, that was how it was going to be. 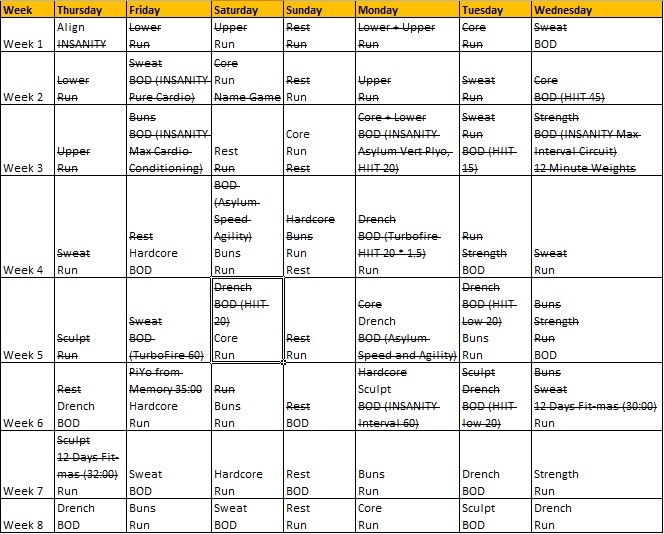 I enrolled in an extreme fitness class (the same one I’d done 8 years earlier where I met my husband) and did my initial testing on June 14th. I weighed 180.6 pounds and my body fat percentage was 33.9% on day one. In that 10-week program, I lost 25.0 pounds and dropped my body fat percentage to 25.8% (a loss of 8.1% points which was 24% of the fat on my body). I kept pushing myself and got into running again, then into INSANITY and TurboKick and BodyPump at the YMCA, and kept kicking and hitting the kickboxing bag in our garage. I shed more weight and more body fat percentage points. I dropped another 15 pounds and shed another 3-4%-age points of body fat from September 2014 through the end of January 2015. I was on a roll and I’d never been so fit in my life (including my youth), so I wasn’t going to let anything stop me. 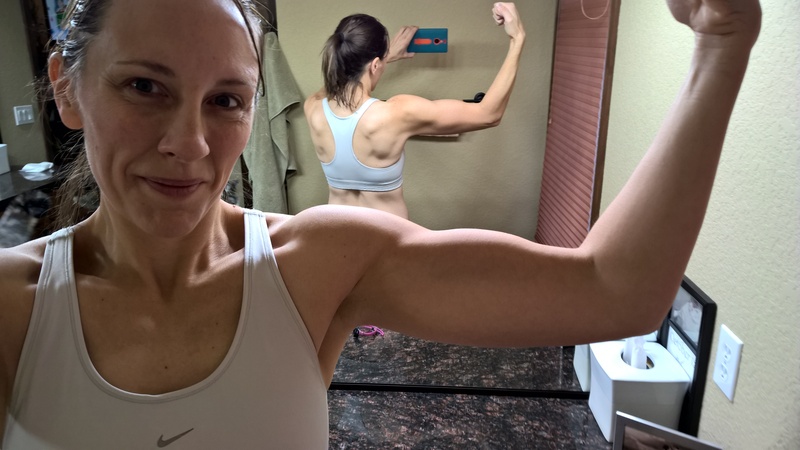 I’ve maintained that weight (140’s) and body fat range (no higher than 24%) through all of 2015. Today, I weigh anywhere between 138 pounds (on a good day) and 141 pounds (on a bad day). My body fat percentage is between 21.2% and 21.6% from day-to-day. I keep pushing, I keep working, I keep changing it up. I have goals, goals that I’m not sure I can meet (comfortably in the 130’s, a body fat percentage consistently below 21.0%), but I have them anyway. Goals are important. I’ve never been one to be happy standing still, no matter what I’m up to at the time. Crafting, career, getting pregnant, parenting, fitness – I’m always pushing the envelope and working harder. I’m not going to stop setting goals now that I’ve reached goals I never thought I’d meet – I’ve worked too hard to get here to just stop. It’s been a fun, grueling, high-energy, sometimes painful, but always successful 18 months. I intend to keep on going, to keep getting stronger, to get a little leaner, to become even happier. 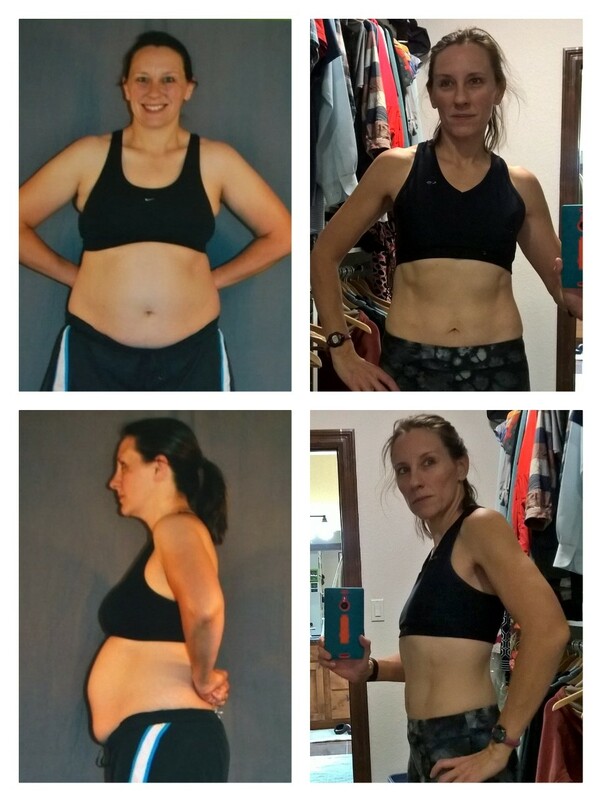 I look back on my “before photos” from June 14, 2014, and I don’t even recognize that gal. I look nothing like her, I feel nothing like her, I think nothing like her. I’m a new person (or rather, the person I was before infertility took me into its grip), and I like the current me a lot more than I liked that gal back in mid-2014. I know that my weight and body fat percentage will fluctuate throughout the rest of my life, but I better NEVER be that gal from June 2014 EVER again. 8 Week Countdown to NYE – Week 4 – HALF WAY DONE! 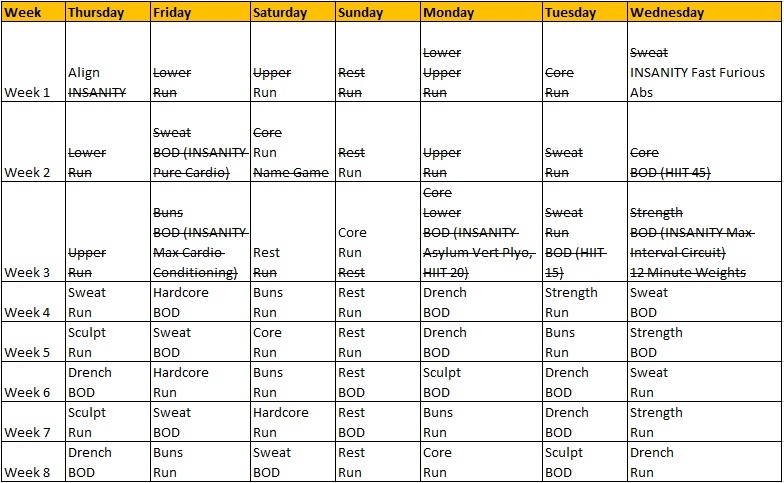 Week 4 (Ending 12/02/15) – Half Way Done!